Nicholas Branch has unpublished state documents, polygraph reports, Dictabelt recordings from the police radio net on November 22. He has photo enhancements, floor plans, home movies, biographies, letters, rumours, mirages, dreams. This is the room of dreams, the room where it has taken him all these years to learn that his subject is not politics or violent crime but men in small rooms. Is he one of them now? Frustrated, stuck, self-watching, looking for a means of connection, a way to break out. After Oswald, men in America are no longer required to lead lives of quiet desperation. You apply for a credit card, buy a handgun, travel through cities suburbs and shopping malls, anonymous, anonymous, looking for a chance to take a shot at the first puffy empty famous face, just to let people know there is someone out there who reads the papers. Branch is stuck all right. He has abandoned his life to understanding that moment in Dallas, the seven seconds that broke the back of the American century. When I studied literature at uni it was my task to probe deeply into one work of literature at a time, painstakingly dissecting each then fossicking through the rubble for its secrets. On these I was welcome – nay, expected! to write 3000 words. I failed to appreciate this luxury at the time, not knowing or caring that the public like to read things online for perhaps one minute; maybe, if they are very interested, two. Now that my day job, like so many others’, requires bounding from task to task, email to email and snatching fragments of time for ‘deep work’ that feels as difficult as giving birth (note, I have never given birth), I look back on that time with wonder. Immediately after it, I avoided ‘hard’ books, plunging through as much crime fiction as I possibly could, and while a murder mystery is one of life’s purest pleasures, the deep reading mind is like a muscle. If you don’t use it, you lose it. Sometimes I fear I have lost it altogether, and nowhere as much as in the attempt to read Don DeLillo, a postmodernist author described aptly by New Republic as “master chronicler of American dread” in a recent article about how it’s high time he won the Nobel prize already. Each book is entirely different in subject matter to the last. White Noise, perhaps the most famous, I dissected at university. This story of a professor’s terror of death after an ‘airborne toxic event’ hits his town was one of the best books I have ever read. Cosmopolis is about a genius billionaire financier who spends the whole book taking a limo across town to get a haircut, encountering various riots and lovers along the way. While it was startlingly inventive I probably, honestly, only got through it because it was relatively short. Later, I thought about watching the movie, a 2012 David Cronenberg production starring Robert Pattinson, but I think I abandoned this idea within minutes. I hope the adaptation of White Noise now underway does better. Underworld was a massive tome of 1000-odd pages sparked by the parallel events of the 1991 New York Giants’ Superbowl win, and the Soviet Union’s explosion of its first nuclear bomb. It was widely acclaimed as a Great American Novel. I lugged on a camping trip a year or two ago, read a couple of hundred pages, admired the incredibly beautiful writing, then turfed it in favour of something easier. Turns out even in ideal surroundings, I couldn’t muster the necessary concentration. I was full of theories at the time after a bout of minimising that if I wasn’t enjoying something, I shouldn’t bother, life too short, etc, but it was likely just a cover for the towering ineptitude I felt, failing to force my fragmented modern brain to focus. So when I recently arrived at Libra, I was full of determination to get some intellectual gumption. 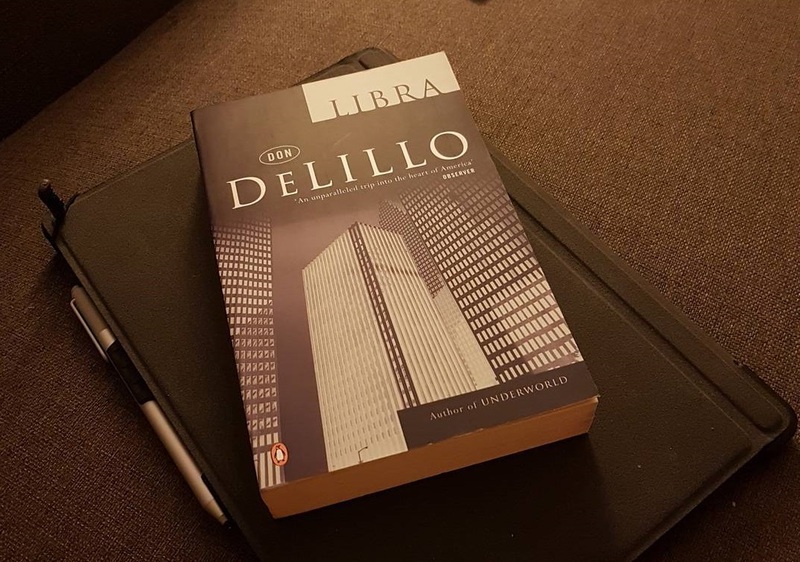 Libra, as ambitious as the rest of DeLillo’s novels, blends fiction and fact to recreate the lives and events that coalesced into the assassination of President John F. Kennedy. Threaded throughout it are flash-forwards to the life of Nicholas Branch, an ageing CIA official assigned to write the secret history of the assassination, for Agency eyes only. He has been supplied with every possible material and left alone for years. Decades, even. He thinks they might have forgotten he’s on the payroll. He goes to sleep in his chair sometimes, surrounded by papers and countless words in a room the Agency has paid to fireproof. He has his forensic pathology rundown, his neutron activation analysis. There is also the Warren report, of course, with its twenty-six accompanying volumes of testimony and exhibits, its millions of words. Branch thinks this is the megaton novel James Joyce would have written if he’d moved to Iowa City and lived to be a hundred. Everything is here. Baptismal records, report cards, postcards, divorce petitions, canceled checks, daily timesheets, tax returns, property lists, postoperative x-rays, photos of knotted string, thousands of pages of testimony, of voices droning in hearing rooms in old courthouse buildings, an incredible haul of human utterance. It lies so flat on the page, hangs so still in the lazy air, lost to syntax and other arrangement, that it resembles a kind of mind-spatter, a poetry of lives muddied and dripping in language. Documents. There is Jack Ruby’s mother”s dental chart, dated January 15, 1938. There is a microphotograph of Lee H. Oswald’s public hair. Elsewhere (everything in the Warren Report is elsewhere) there is a detailed description of this hair. It is smooth, not knobby. The scales are medium-size. The root area is rather clear of pigment. Branch doesn’t know how to approach this kind of data. He wants to believe the hair belongs in the record. It is vital to his sense of responsible obsession that everything in his room warrants careful study. Everything belongs, everything adheres, the mutter of obscure witnesses, the photos of illegible documents and odd sad personal debris, things gathered up at a dying – old shoes, pajama tops, letters from Russia. It is all one thing, a ruined city of trivia where people feel real pain. This is the Joycean book of America, remember – the novel in which nothing is left out. Branch has long since forgiven the Warren Report for its failures. It is too valuable a document of human heartbreak and muddle to be scorned or dismissed. The twenty-six volumes haunt him. Men and women surface in FBI memos, are tracked for several pages, then disappear – waitresses, prostitutes, mind readers, motel managers, owners of rifle ranges. Their stories hang in time, spare, perfect in their way, unfinished. It was slow going at first, with me hampered by my lack of understanding of the events of that Cold-War era, the Bay of Pigs, the Cuban Missile Crisis, the relationship of JFK with his people, the street life of Dallas, Miami and New Orleans, which may as well be on another planet to Perth, Western Australia, 2017. I spent the first quarter of the book Googling details I felt, with shame, that I should already know. My eyes glazed over at times. I was spurred on by the moments of just utter perfection I stumbled upon like treasure. The dog lay throbbing in the shade. Frank Vasquez showed up with a wife, two kids and some food. The wife and kids took a peek at the visitor. Wayne waited for someone to say, “Mi casa es suya.” He got a little charge from the Old World graces. But they slipped back inside, leaving his smile hanging like a rag on a stick. One hot afternoon, I lay down in front of a fan, away from my mobile phone, and told myself I could not get up until I had read solidly for an hour. This helped get me over the hump. I finally joined the slipstream. I became absorbed. I almost began to feel as though I were reading a crime novel as this reminded me, in its beautiful ugliness and powerful sense of place, of James Ellroy’s L.A Confidential, also set in the 1950s. But between its chronicling the FBI, CIA, New Orleans crime lords, and their circling a stumbling Lee Harvey Oswald like hawks, it returns repeatedly to Branch, locked in his study receiving more and more reference material. Language begins to loom as a character as much as any other, and perhaps the most powerful, able to oppress those who seek release through it but are unable to control it – not just Branch but Oswald too, whose disability in reading and writing completes his isolation even as he tries to harness words to lessen it. It was his goodbye to Russia. It signified the official end of a major era in his life. It validated the experience, as the writing of any history brings a persuasion and form to events. Even as he printed the words, he imagined people reading them, people moved by his loneliness and disappointment, even by his wretched spelling, the childish mess of composition. Let them see the struggle and humiliation, the effort he had to exert to write a single sentence. The pages were crowded, smudged, urgent, a true picture of his state of mind, of his rage and frustration, knowing a thing but not able to record it properly. Always the pain, the chaos of composition. He could not find order in the field of little symbols. They were in the hazy distance. He could not see clearly the picture that is called a word. A word is also a picture of a word. He saw spaces, incomplete features, and tried to guess at the rest. This point is arrived at not logically, not by reason, but inevitability. Plots carry their own logic. There is a tendency of plots to move toward death. He believed that the idea of death is woven into every plot. A narrative plot no less than a conspiracy or armed men. The tighter the plot of a story, the more likely it will come to death. The novel closes in a hypnotic exploration of the endless looping replay of the terrible shootings on screens both of Kennedy and of Oswald. They somehow never get to the heart of what happened any more than Branch, locked in his maelstrom of paper, can. By its wrenching close, I’m mesmerised. DeLillo will never be light reading. There is no reason he should be. He has to be one of the world’s best writers and you meet him on his terms. Read it and weep… and remember, the best things don’t come easy. This entry was posted in Books, Fiction and tagged American history, Bay of Bigs, CIA, Cosmopolis, Cuba, Cuban Missile Crisis, Dallas, DonDeLillo, Ellroy, Fidel Castro, JFK assassination, John F Kennedy, L.A. Confidential, Lee Harvey Oswald, Libra, plot, postmodernism, Underworld, White Noise, White Noise movie by Emma Young. Bookmark the permalink.